This year has been a great year for me photography wise as earlier in the Spring I had one of my Dallas Mavericks shots make a billboard for their 2010-2011 ad campaign. 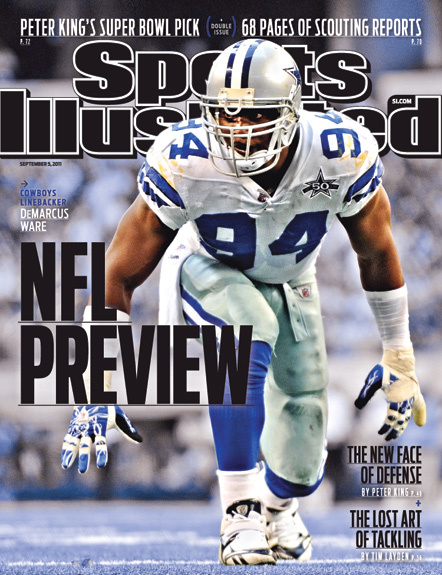 On Sept 1 I was made aware of one of my shots of DeMarcus Ware of the Dallas Cowboys making it on the cover of Sports Illustrated’s 2011 NFL Preview. What an honor to make the cover of SI. Here’s the shot that was selected. A special thanx to my wife and kids, my parents, my Godparents and all my family and friends for all their Love and support throughout the years. Also my Uncle Paul who was the whole reason I became an artist. I know he got his own copy of this up in Heaven and is proud.